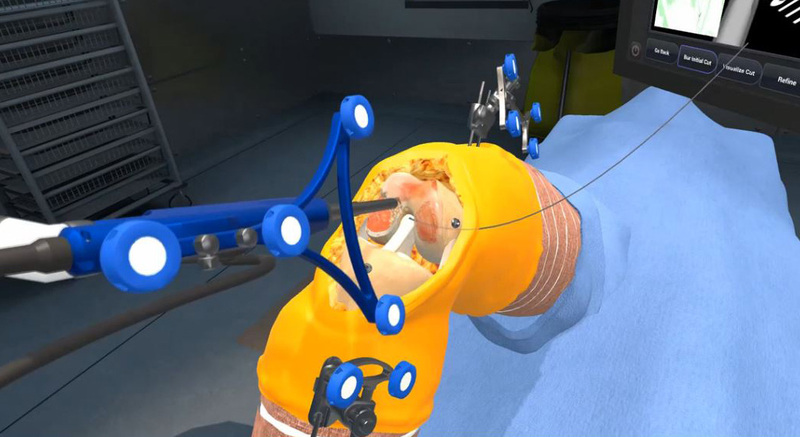 Osso VR, a validated virtual reality (VR) surgical training platform, has announced a first-of-its-kind VR training module for Smith & Nephew’s NAVIOTM Surgical System. The system is being demonstrated at the American Academy of Orthopaedic Surgeons (AAOS) 2019 Annual Meeting March 12–16. Smith & Nephew offers the largest knee portfolio enabled by robotics and is the only company that offers the accuracy (with the use of the handpiece)1–9 of robotics-assisted technology for bi-cruciate retaining total knee implant (JOURNEY II XR). The NAVIO Surgical System is a next-generation handheld robotics platform, providing high levels of accuracy1–9 in an easily expandable robotics platform. Unlike other robotics-assisted platforms, the NAVIO system eliminates time, costs, and radiation exposure associated with preoperative CT imaging, allowing for real-time imaging in surgery to build a patient-specific 3D model. It also eliminates preoperative logistics for physicians and staff and has a lower cost of ownership10 compared with other robotic-assisted platforms in the market. The virtual reality training experience for the NAVIO system will be demonstrated at the Smith & Nephew booth #3421.